DESCRIPTION -- This Superb find from the Royal Naval vessel the HMT (Hired Military Transport) Dorsetshire which is an early cigarette case used by crew members on board. It shows on the from the emblem and name of the vessel with a decorated edge, and is in a fairly good condition and dates from around the 1940â€™s (click on the picture to see a closer view of the item). HISTORY -- The MV â€˜Dorsetshireâ€™ served as a hospital ship during WWII; where and when it became to be used as a Troopship is lost in time, She transported one of the last REME drafts to the Far East. Draft DLKTT departed Liverpool on 1st September 1953 bound for Aden, Colombo, Singapore and Hong Kong. On its return to UK it was retired from service. DESCRIPTION -- From the Royal Naval vessel the HMS Anson this is a wooden napkin ring made out of the deck timbers of the vessel. It shows on it a metal plaque and reads on as shown below and dates from the 1930'. HISTORY -- HMS Anson was a King George V-class battleship of the Royal Navy, named after Admiral George Anson. She was built by Swan Hunter and Wigham Richardson Shipyard and launched on 24 February 1940, being completed on 22 June 1942. Her completion was delayed to allow the fitting of fire-control radar and additional anti-aircraft weapons. She was originally to have been named Jellicoe, but was renamed Anson in February 1940. DESCRIPTION -- From 1937 a wooden barrel made from the teak of HMS Snapdragon which is in a great condition and was made for the coronation in that year. The size is 3" (8cm) high and it shows a plaque on the front engraved with name and details (click on the picture for a closer view). DESCRIPTION -- From HMS Splendid this is a souvenir round wooden plaque with name in centre and is 5Ãƒâ€šÃ‚Â½" (14cm) wide dating from the 1930's. HISTORY -- HMS Splendid was a Royal Navy nuclear-powered fleet submarine of the Swiftsure class. From her launch in 1979 she took part in many conflicts involving British forces around the globe and was decommissioned in 2004. DESCRIPTION -- From the Royal Naval vessel HMS Devonshire this is a round copper dish and the size is 3Ãƒâ€šÃ‚Â½" (9cm). It is an early produced item and shows in the centre to ships crest and is in a good condition (click on the picture to see a close up of the ships crest). HISTORY -- HMS Devonshire, pennant number 39, was a County-class heavy cruiser of the London sub-class built for the Royal Navy in the late 1920s. The ship spent most of her pre-World War II career assigned to the Mediterranean Fleet aside from a brief tour with the China Station. She spent a few months after the start of the Second World War in September 1939 in the Mediterranean until she was transferred to the Home Fleet and became flagship of a cruiser squadron. 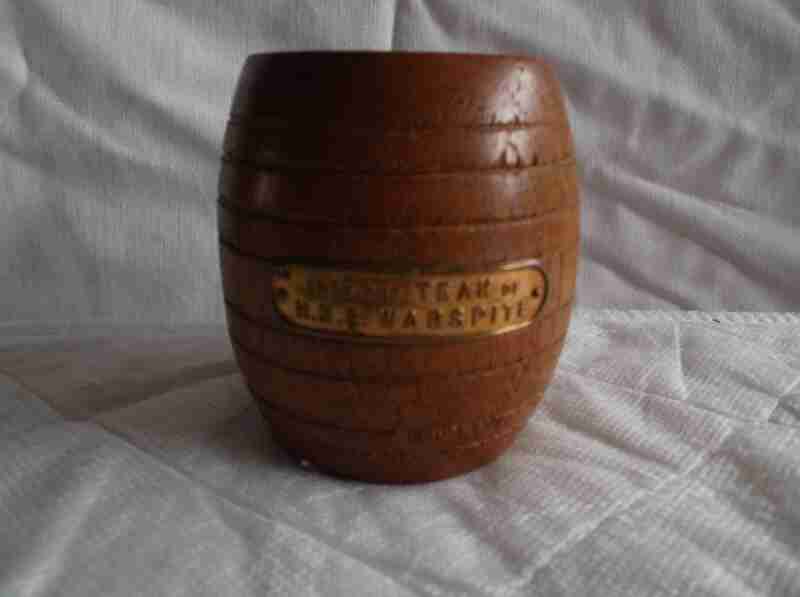 DESCRIPTION -- Wooden barrel made from the timbers of the Royal Naval vessel HMS Warspite with the size being 3" (8cm) high and it shows a plaque on the front wengraved with name and details. It dates from the 1930's and is in a good condition (click on the picture for a closer view). HISTORY -- Seven ships of the Royal Navy have been named Warspite. The origins of the name are unclear, although it is probably a pun on the word 'spite', in part embodying contempt for the Navy's enemies, but also the common name for the green woodpecker, suggesting the 'Warspite' would poke holes in enemy ships' (wooden) hulls. This HMS Warspite (03) was a Queen Elizabeth-class battleship launched in 1913. She served in the First World War and in numerous operations in the Second World War, earning the most battle honours of any Royal Navy ship. She ran aground on her way to be broken up in 1947 and was scrapped in 1950. 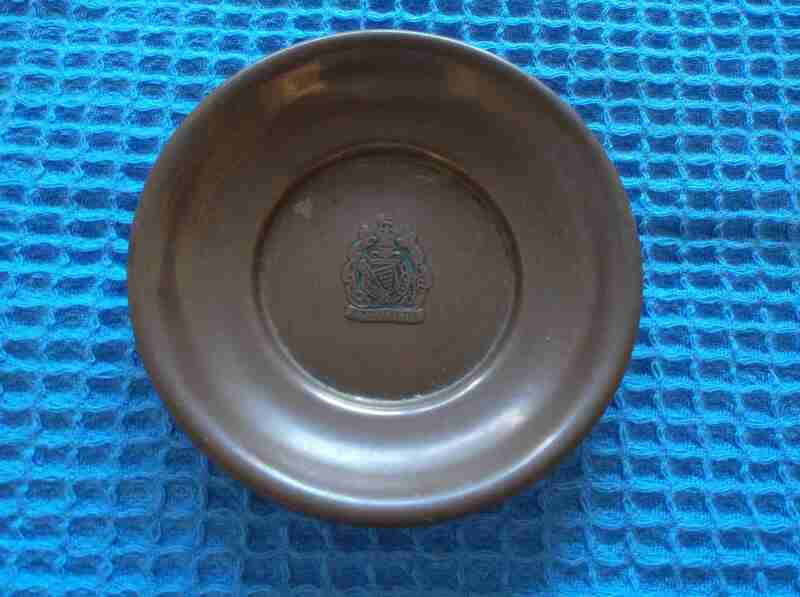 DESCRIPTION -- Early great condition souvenir item from the Royal Naval vessel HMS Cornwall and is a copper dish which is 4" (10cm) wide and shows the ships emblem in the centre. HISTORY -- HMS Cornwall, pennant number 56, was a County-class heavy cruiser of the Kent subclass built for the Royal Navy in the mid-1920s. She was built at Devonport Dockyard (Plymouth, UK). In a single ship action of 8 May 1941 Cornwall sank the German commerce raider Pinguin but was hit in the stern. She returned to Durban for repairs, which were completed on 10 June 1941. On 25 November 1941, Cornwall intercepted the Vichy-French merchant Surcouf off the east coast of Somalia and brought her to Aden. Surcouf was en route to Djibouti with food. 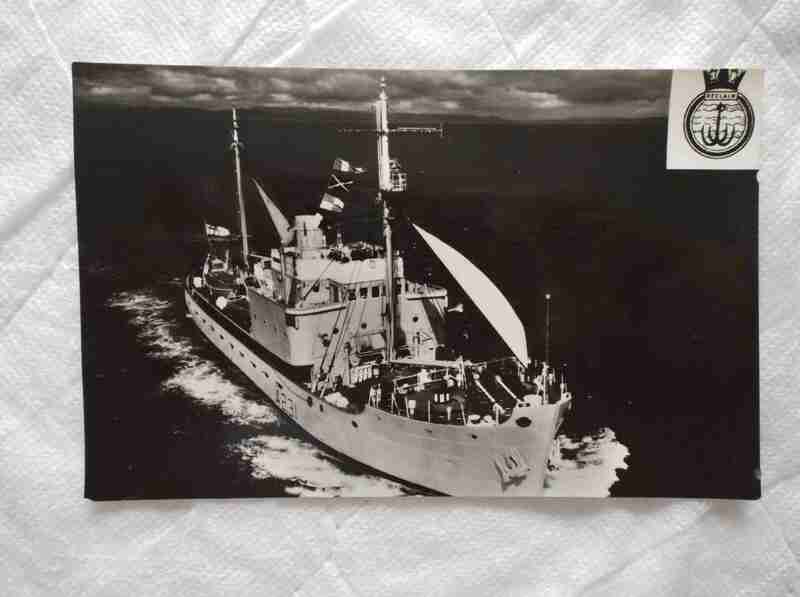 DESCRIPTION -- A postcard sized photograph of the Royal Naval ship HMS Reclaim which is in an excellent condition. HISTORY -- HMS Reclaim is the first of two multi-role hydrographic survey ships commissioned by the Royal Navy. With her sister ship, HMS Enterprise, they form the Echo class of survey vessels. She was built by Appledore Shipbuilders in Devon in 2002 and is the ninth Royal Navy vessel to carry the name. 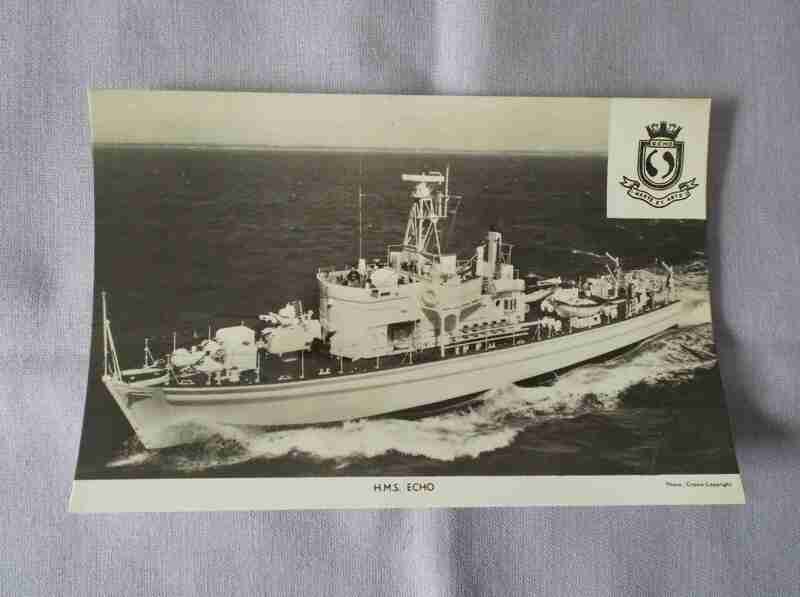 DESCRIPTION -- Postcard of the Royal Naval ship HMS Echo which is in an excellent condition. HISTORY -- The Echo-class was a class of inshore survey vessel built for the British Royal Navy in 1958'1959. The class was designed to operate in close waters such as harbour approaches, shipping lanes, rivers and estuaries. Together, the ships of this class formed the Royal Navy's Inshore Survey Squadron. 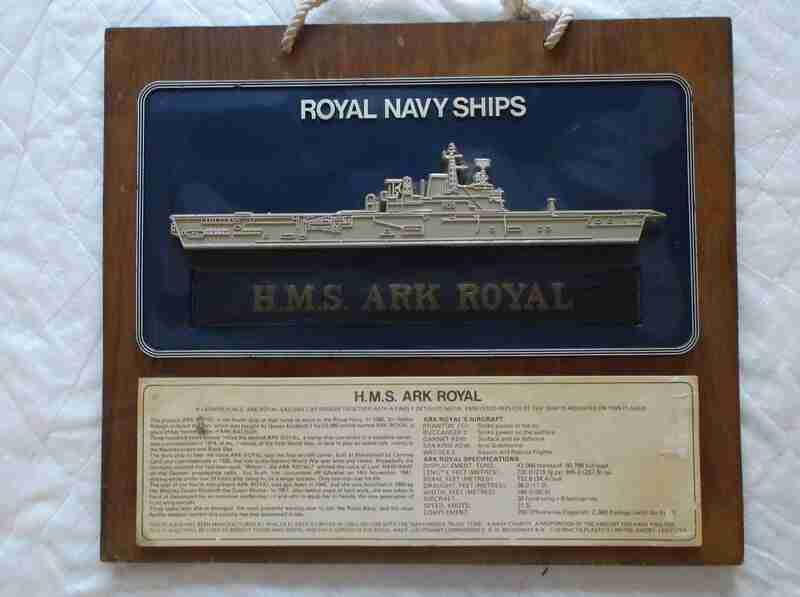 DESCRIPTION -- Moulded model of HMS Ark Royal launched 1950 and produced on a solid wooden plaque. It comes with an original cap tally and full details of the vessel and is 12" (30cm) x 13.75" (35cm) in size and all in a good condition. HISTORY -- The ship was originally designated 'Irresistible', but was renamed 'Ark Royal' prior to launch. The immediately previous Ark Royal, also an aircraft carrier, was torpedoed off Gibraltar on 14 November 1941 with the loss of one member of the ship's company. She was launched in 1950, and her completion took five more years. In this time, she underwent redesign and, when completed, she was markedly different from her sister ship.